There’s no denying that at Rs. 799, the Mi earphones are a fantastic deal. The overall performance, build quality and design make these a very good buy and another successful product from the Mi stables. Those looking for a warmer and slightly less treble oriented approach should consider the Cowon EM-1s at the same price. Since Mi started its India operations in July of this year, the company has also looked into accessories that complement its smartphones. Apart from power banks and cases, Mi is also selling its earphones in India. The Mi earphones are of the in-ear variety and sport, what the company refers to as, the ‘Piston Design.’ The price-tag of Rs. 799 should definitely spark the interest of anyone looking to buy budget earphones, but are these earphones worth the money? The Mi earphones have a 1.2 metre long Kevlar fiber cable that manages to stay untangled even when kept messily in a bag or in the pocket. The cable appears quite hardy at least up to the cylinder with the in-line controls beyond which the split cable takes up a more traditional guise with its rubber coating. The rest of the earphones, including the 3.5mm connector and the earpiece unit that houses the drivers and the flanges, are made of ribbed metal. The overall build quality is fantastic, almost unbelievably so, especially when you consider the price of these earphones. The earphones (we got the rose gold variant, the only one available in India right now) also look very good, and you could easily pass these off as something that cost at least three times more. A nice bonus is the packaging that the earphones come in. While it’s not a carry case, the box is very well built and has a heavy moulded rubber section to fit the earphones in and wrap the cable around, and under it, three extra pairs of differently sized flanges and a metal clip to keep the cables in place when plugged in. 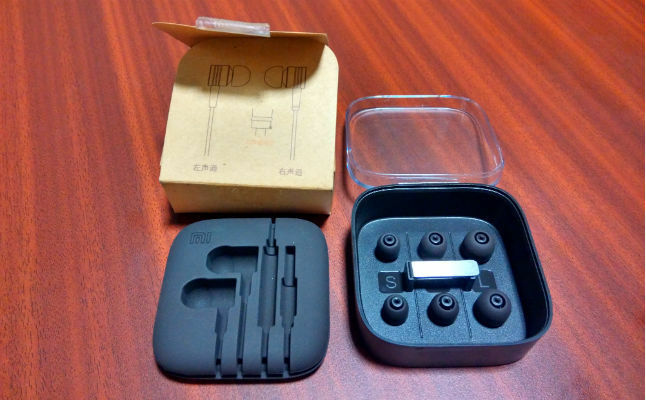 The packaging, which could easily serve as a gift box, and the overall build and design of the earphones are now the benchmark by which we will judge future budget earphones. Yes, they’re that impressive. The Mi earphones are one of the most powerful we’ve run across at this price range. These earphones are really, really loud and even at the max volume, there is little distortion except for some static that leaks in occasionally. The earphones are also capable of very good clarity. The Mi earphones tend to fall on the flat and dry side of things with a preference for mids and highs over bass. In the Disturbed track, in which the production sets no special preference for bass, the output is almost entirely limited to the highs and the mids. However, in the Daft Punk track which is almost entirely mids and bass, the low-end sounds punchy and clear and not overpowering. The way the Mi earphones handle highs is further exemplified by the Jack Johnson song in which the cymbals and hi-hats are highlighted very well. The Mi earphones will also have you missing out on resonance and warmth especially if you listen to a lot of baritone singers, as we saw in the case of the Mark Knopfler track, in which the vocals sounded too dry and thin. On the other hand, if a song is overly reliant on highs, then the Mi earphones run the risk of sounding shrill. However, a well mixed song where the highs and the low-end both have room, as is the case with the Miles Davis track, is reproduced well by the Mi earphones. To sum it up, bass heads will not like the Mi earphones but those with a preference for mids and highs will be pleasantly surprised. Fans of rock, jazz and pop vocals may seriously consider these earphones, while fans of hip-hop and electronic music may want to look at the Cowon EM-1s. The Mi earphones also have in-line controls- three buttons that are supposed to control volume, playback and voice navigation but strangely, their performance is inconsistent. We tried out the earphones with three smartphones- the HTC One E8, the Moto X (1st gen) and the Mi 3. With the HTC, the buttons wouldn’t control the volume, with the Moto X, only the play/pause button worked, whereas with the Mi3, the volume controls worked but they couldn’t skip the tracks. In all three cases the buttons worked when it came to launching voice search and accepting calls.